PAMA Lemonade Recipe - our "Signature Summer Cocktail"! Lemonade, vodka and PAMA liquor. So refreshing! Great for summer entertaining. Can make ahead of time and refrigerate until ready to serve. How is everybody's summer going? We've been relaxing and hanging out with friends. We had some friends over a few weeks ago for a pizza party. I made the dough and everyone assembled their pizzas. I set out the toppings on the table and everyone patted out their dough and went down the line for sauce, cheese and toppings. We had so much fun! The kitchen was hot because of the oven cooking the pizzas. We had to cool off with this yummy PAMA Lemonade. I always like to have a fun cocktail for our parties. I like to make a big batch of something so it is easy for everyone to serve themselves. 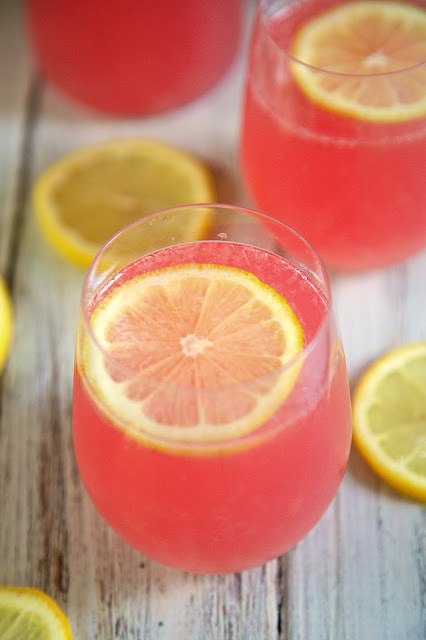 This PAMA Lemonade is perfect for a summer party. It makes a lot and is SO good. Depending on how many people you have coming over, you might want to double this recipe. I make it the night before and keep it in the refrigerator until everyone arrives. I serve the drink in a carafe and just refill it when it gets low. Entertaining is so much easier when you don't have to worry about mixing drinks. I have named this our "Signature Summer Cocktail". It only has 3 ingredients and tastes fantastic! The drink has lemonade, vodka and PAMA liquor. 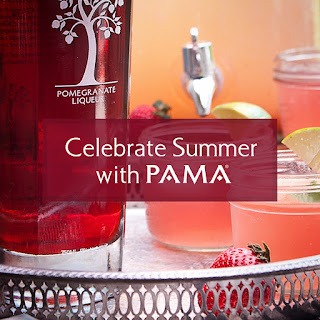 In case you aren't familiar with PAMA (some of my friends weren't), PAMA is made with all-natural pomegranate juice, premium vodka and a touch of imported tequila. 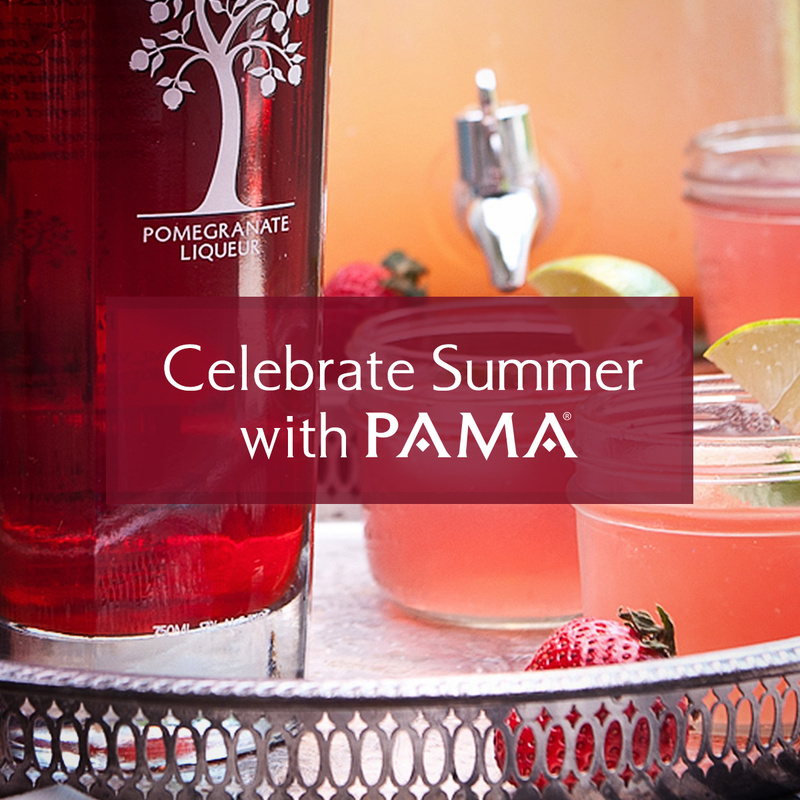 PAMA is 34 proof - perfect for mixing in a cocktail. 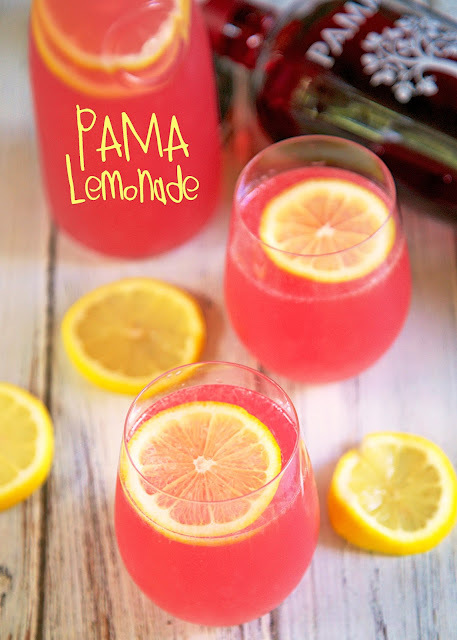 I can see this PAMA Lemonade making an appearance at all our summer get togethers and at the football games this fall. This PAMA Lemonade would also be great in the PAMA Shandy I shared a couple of weeks ago. Just substitute this for the lemonade and PAMA in the shandy. Half PAMA Lemonade and half beer. YUM!! PAMA is running a summer contest. Entrants must create a Pinterest board that details what their ideal summer party would look like- from theme to décor to drinks, andparty tips. Winners will receive the chance to make their summer party come to life, with somehelp from PAMA. There will be one grand prize winner and four runners up. Oh, man! That looks delicious!